Recently, Howard The Duck found himself in the clutches of The Collector. But with a little help from his cellmate Rocket Raccoon and his buddies in the Guardians of The Galaxy, Howard was able to escape from captivity. More recently, Howard - on a quest for the Nexus of All Realities - had a rather violent encounter with half of the Frightful Four. But he survived intact... only to have another violent encounter with two characters who seemed to be female versions of himself and Rocket. Now, we shall learn the story of how Howard and Rocket were cloned before they escaped the clutches of The Collector. As well as the unholy origins of Linda the Duck and Shocket Raccoon! Well, not that unholy really - they were raised by a Collector employee who went rogue and took them back in time to escape his boss. But "unholy origins" sounds better. 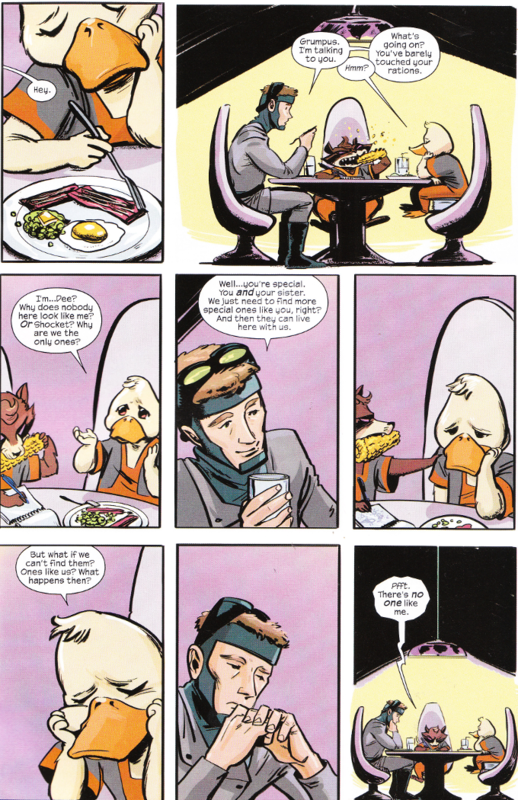 The main story of this month's Howard The Duck is an interesting diversion but not much more than that. Chip Zdarsky goes light on the humor with this tale, which- given that the comedy is the main draw of this series - seems an odd choice. The artwork by Veronica Fish is decent enough but doesn't demand attention. All in all the whole package is rather bland. Not bad, mind you, but hardly memorable. 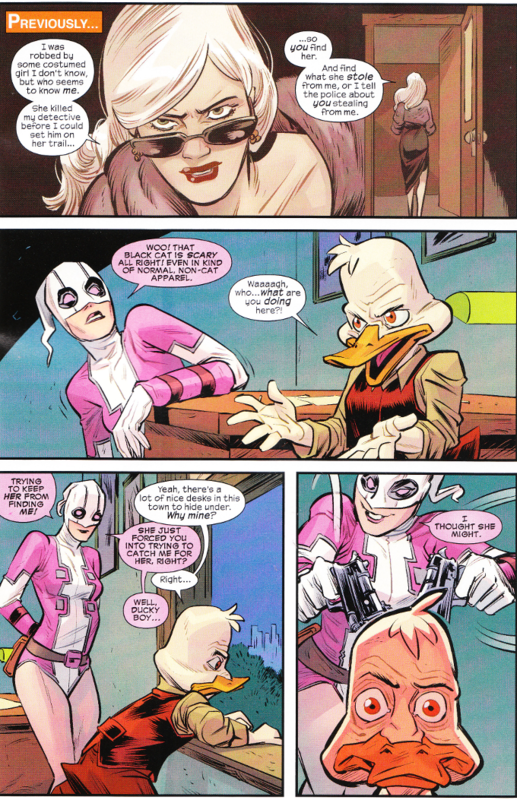 Thankfully the back-up story by Christopher Hastings - featuring the utterly insane Gwenpool - more than makes up for the short-comings of the main story. The artwork by Danilo Beyruth and Tamra Bnvillain matches the story in its vibrancy and manic energy. And, oh yes, Howard is actually in this one!